First impressions count for a lot. It has been calculated that on average it takes only three seconds to form an impression of another human being. I don’t know if that rationale follows to forming an impression of a dirt bike, but love or hate the somewhat unusual looks, the TE Husqvarna TE310 is a bike with it’s own definable character and deserves that you swing a leg over and try it out. 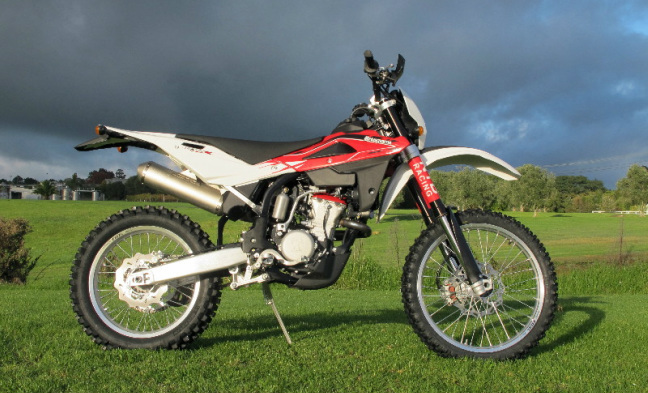 The TE310 is Husky’s dedicated enduro racer and as such can be road registered in NZ. It comes complete with minimal road kit, as required by Australian and European law for any dirt bike used recreationally outside of a dedicated motocross track. 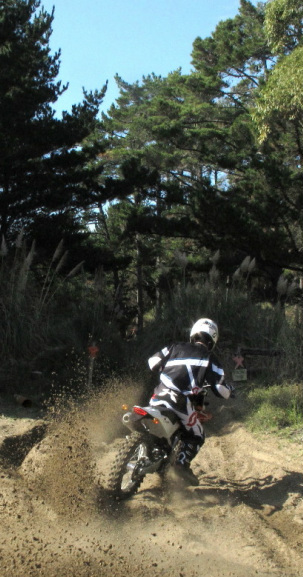 As we all know this is not so far a requirement off road in NZ, so the Husky 310s more commonly seen here are the USA spec TXC cross country only models. What is not so commonly known is that the TE and TXC models share the same engine, chassis and suspension components. There are minor differences in suspension and engine set-up, but from a base component viewpoint the bikes are essentially the same. 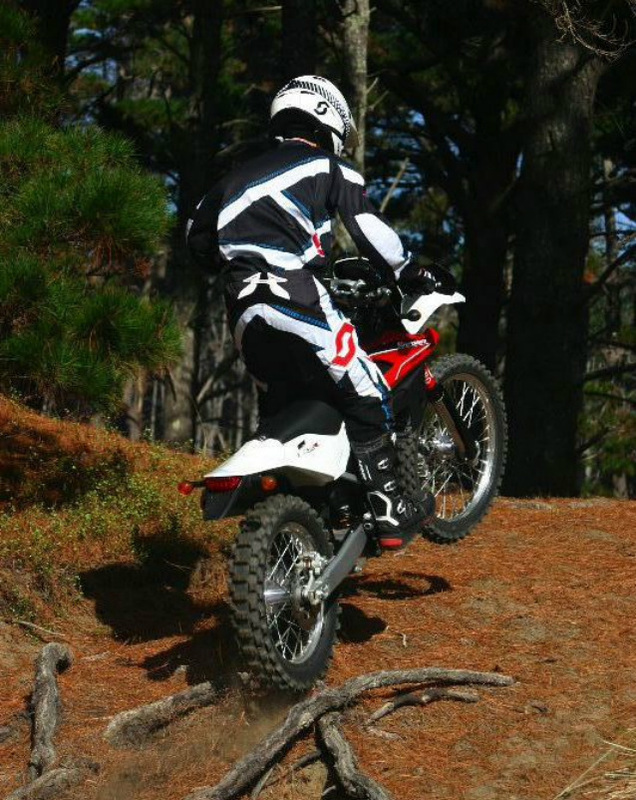 In an enduro situation a TE will run with a TXC any day of the week, or weekend for that matter. My interest in the TE model comes about for it’s versatility as an all round dirt/adventure trail rider. By simply adding and subtracting lights and indicators a TE 310 can make an equally good enduro race choice, serious trail bike, or even multi-day adventure trail bike for one of those iconic 5 day Otago trail rides. If a few grams of extra wiring bother you then turn your attention to the TXC, virtually the same bike pared back to the bone. The TE310 came about when Husky began experimenting to add muscle to their 250 four stroke, more muscle that is, without adding fat. This strategy is of course is a tried and proven recipe for success. Way back in the 1960s BSA developed a 350 four stroke that was lighter more powerful and vastly more agile than their existing 500 and so the formula has been continued ever since. The Husky TE310 engine is in fact a bored and stroked TE250. This year the TE310 received important Keihin fuel injection and other top end upgrades that have boosted power and torque all through the range. First impressions are of a strong and lively free-revving engine with way more motivation than any 250 four stroke. So strong is the response that on firm ground at least, the six close ratio gears seem to come and go in a flash, feeling almost too close. When the going is soft and power-sapping however the relatively small gaps between ratios come as a blessing and there’s another advantage that in slippery conditions the engine easier can bet short-shifted more easily to promote traction. Overall power is strong from just above idle revs and the 310 engine will to the moon as happily as a 250. Flywheel effect is quite light, so the 310 engine gathers revs quickly. Exciting as this can be it has some down sides however the light crankshaft can induce unwanted wheel spin over logs or tree roots and quickly shut out the fire completely and stall. The light flywheels require that you either be very fast on the light hydraulic clutch, or avoid such compromising places whenever possible. Like most four strokes the TE310 is not at its best in extreme enduro situations. Second impression of the TE310 is of a compact chassis leading to agile, though neutral handling characteristics. The chassis is derived strongly from the Husky 125 two stroke enduro machine and this shows in the direct way the bike steers and changes lines very easily and overall feels very light. Though the chassis is built to be nimble there is no front heavy feeling in the weight bias, or spooky unplanned course changes to startle the pilot. Suspension is by Kayaba on the later models Huskys. On the TE fork action is relatively plush. The single chamber Kayaba forks that feel to be a touch softer in overall action than the TXC cross country model. In enduro conditions the forks provide a well controlled ride, adequately stiff for hard charging on open forest trails and compliant on tree roots to maintain accurate steering. There’s plenty of adjustment on the clickers to up the stiffness for more open terrain, though genuinely fast cross country racers might consider a re-valve. At the rear the Kayaba shock was for me plush yet confidence inspiring at all times. Brembo brakes front and rear were powerful, yet sensitive, with a full range of adjustment provided on pedal and hand levers. As to the Husky’s styling, well not everyone I spoke to liked it, though even the detractors seemed to soften once they had ridden the bike and been won over by the performance. While I am happy enough with the styling, I am not convinced with the seeming complexity of parts comprising the radiator shroud package, I think this could have been simplified. Otherwise the TE310 is well put together, more so it has some nice detailing and individual touches, for example the cooling fan, an optional extra on many other enduro models. The sum total of a lively chassis and responsive engine make for a fun bike to ride in most conditions and the TE310 delivers the rider miles of smiles from the get go, from casual trail riding to multi-day adventure trail rides and right up to enduro competition level. No, the TE310 hasn’t got the wallop of a 450, its never going to, nor is intended to do so. The 310 splits the difference between the recognised FIM 250 and 450 cc racing four stroke classes. The intent is to deliver a bike that embodies the lithe handling and steering of a 250, but with sufficient torque to be ridden in taller gears and with less intense rider input. Almost as importantly the mid-sized bike should be much less tiring to ride and more agile than a 450. In terms of this brief the TE310 succeeds in every respect – as I said, if you are thinking a mid sized four stroke might be just the ride for you are looking, for the TE 310 or TXC for that matter certainly deserve a closer look.